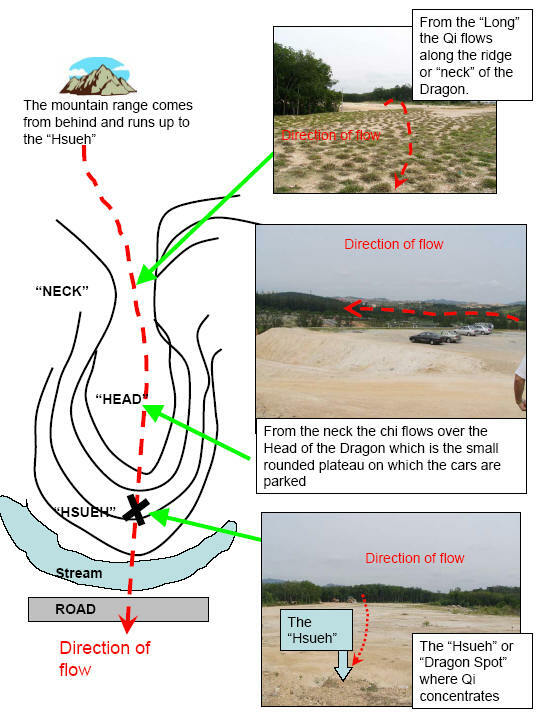 In addition to knowing the theories and applications on Feng Shui (landforms), one must also know how to use a Luo Pan and the skill of Date Selection especially in San Yuan System. Without knowing all this three fields, one’s knowledge of Feng Shui is incomplete. 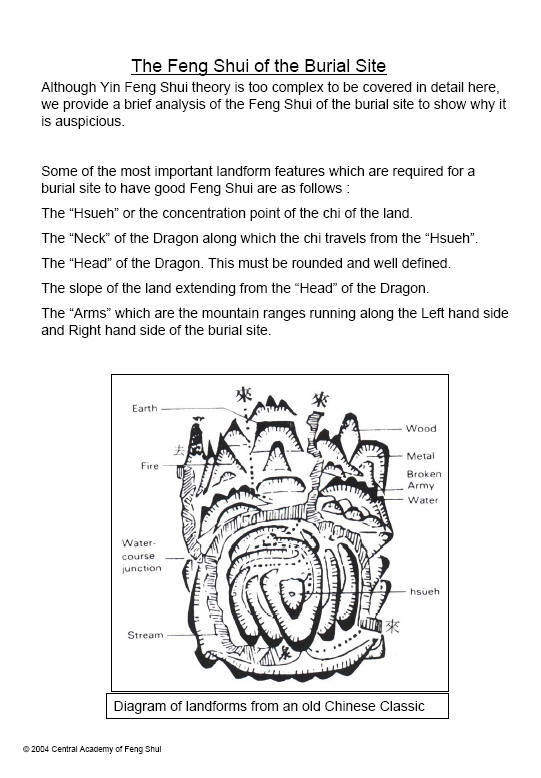 Only on this course Master Leyau will reveal the secret of building Live Grave since he has announced his retirement and hence this is one opportunity not to be missed if you are serious about learning Yin Feng Shui. Yin Feng Shui is to tap the underground Internal Qi and together with External Qi they marry in Xuan Kong giving rise to real potent energy. If you know Qi Gong you can relate better. In Qi Gong, you use internal energy and coupled with external energy from the muscles, you increase the power few fold. Imagine the same analogy in Yin Feng Shui. This diagram here shows how internal Qi travels to affect graves. When the deceased is buried in a properly done grave, it will affect the decendants because they are blood linked. Just like how your parents are linked to you and how they are linked to their parents. So Life Graves or Sheng Ji, works on the same theory except that body but rather parts of the body is used to represent the person. Personal things like hair, finger nails etc are placed into an urn and be buried in similar fashion as how a grave would have been done. Of course, there are proper procedure to do it for it to be effective. The reason for Life Grave is being sought after is because living people can benefit from the internal Qi to boost their luck to achieve what they want. It can be health, luck, prosperity, children luck or even authority. While there are variations on how it is being done, Master Leyau is sharing this method, never shared before to public before his retirement. So if you are interested to bring your level of feng shui to the highest level, this San Yuan Version is something you cannot miss. The Yin Zhai Course will be taught in the English Language personally by Master Francis Leyau who has an extensive experience of 35 years in Yin Feng Shui. Some of his experiences include the supervision of exhuming remains, shifting grave sites, searching and aligning new burial plots, life grave and grave designs. Master Leyau has also been teaching Yin Feng Shui for 30 years. Material courtesy of Master Leyau. The Yin FengShui course is divided into 3 days classroom theory and 6 days Practical and site visits. NOTE: The Course fees include transportations during the on-site Practical, food and site entrance fees (if any). Hotel accommodation is NOT included in the Course fees. Seats are Limited! Secure your seat NOW & secure your future competitiveness! Next postWater Methods – Hey! Water Where Are You Heading To?.